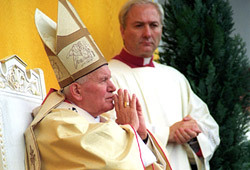 Pope John Paul II was a great pilgrim. His pontificate included journeys to 129 foreign countries as well as 149 pastoral trips within Italy and 301 visits to parishes in the diocese of Rome. Along the way, John Paul II travelled about 1.2 million kilometres, and is hard to estimate the vast number of people who heard and saw this pope in person. 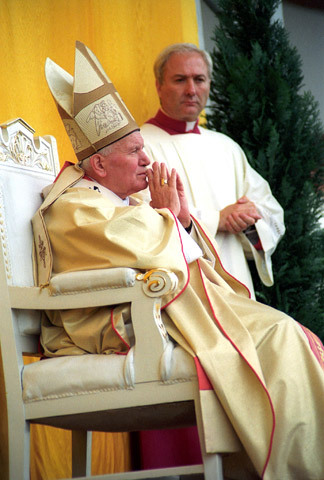 Some 4 million people attended just one Holy Mass which he celebrated in Manila in 1995, and during visits to Poland he would manage to meet up to 10 million of his countrymen in the course of a week. Altogether, John Paul II spent 600 days outside the Vatican and outside Italy, which is 6 percent of his entire pontificate. And immense crowds of journalists were always on hand to catch and analyze every one of his words, every step and every movement. His first trip to Poland, in 1979, brought political consequences of great historical significance. Millions of people jostled to hear the Pope and prayed for the “renewal” of their land. For the people of Poland, the encounter with a fellow countryman who occupied the See of Peter was a moving experience, one which released tremendous energy. Within a few months, and with the Vatican’s support, the Solidarity alliance was born. In a lengthy struggle, the movement ultimately toppled the Communist regime and started the downfall of state socialism in Eastern Europe. John Paul II later caused similar “earthquakes” in Chile, Paraguay, Haiti, the Philippines and Nicaragua. Dictators reigning in those countries dramatically lost their grip on power after visits by the Pope, whose words encouraged alliances in support of freedom and human rights. The massive gatherings in which the pope took part tended to generate new social processes. However the main purpose of his apostolic journeys was not generally to promote political change, but rather to strengthen in a religious sense the Catholic Church in the places he visited. Local Churches would also benefit from being at the centre of society’s attention amid the media coverage of the pope’s trips. During his travels, the Pope often met with representatives of other Christian confessions and with members of non-Christian religious communities. Such encounters particularly helped to give Muslims and Jews a positive view of the pope and the Catholic Church.